In a 2017 report entitled “Strategic Partnerships for Tomorrow’s Health Care,” Sg2 highlights numerous case studies where health systems have engaged in nontraditional partnerships to achieve objectives – including fostering growth and improving performance. In particular, the formation of new community partnerships have helped steer patients to appropriate services, avoid unnecessary Emergency Department (ED) visits, and address the social determinants of health. 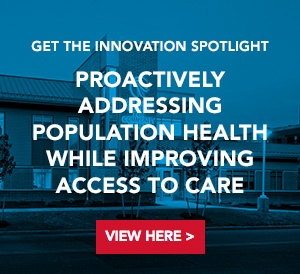 Conceived and designed with these goals in mind, the Golisano Center for Community Health at Niagara Falls Memorial Medical Center (NFMMC) is improving access to care through the formation of strategic community partnerships. The Golisano Center for Community Health offers integrated care to adults and children, including developmentally and intellectually disabled and other at-risk individuals, aimed at preventing the local population from “slipping through the cracks” of the healthcare system. Using several guiding principles, the design strategies and operational solutions aim to improve the health and wellness of the community through preventative care and social support. The adjacent location of the Golisano Center for Community Health provides a direct, physical link to the hospital. A corridor connects the center back to Niagara Falls Memorial Medical Center’s Emergency Department, allowing non-emergent patients that present at the emergency department access to primary care. The primary care clinic offers extended hours that align with the Emergency Department’s high volume timeframes to ensure the right care is available when needed. The non-institutional aesthetic of the lobby is intentionally designed at a residential scale to be inviting and welcoming to the public. The lobby spills into the spacious, multi-function waiting area, which includes lounge seating, a café and computer workstations. The center incorporates Universal Design principles, including 7’ corridors, seamless flooring transitions, and non-glare surfaces and lighting, providing a barrier-free, inclusive environment. Per the Department of Health & Human Services Centers for Medicare & Medicaid Services, “efforts to reduce ED use should focus not on merely reducing the number of ED visits, but also on promoting continuous coverage for eligible individuals and improving access to appropriate care settings to better address the health needs of the population.” The Golisano Center for Community Health includes multiple components, which often work together collaboratively, such as integrated primary care and behavioral health, health home care management and care coordination services, social support services for intellectually and developmentally disabled individuals, and community agencies for child advocacy.